JBL has built a name for itself in the headphone world as a maker of excellent headphones at a reasonable price. We’ve reviewed a ton of those headphones over the past few years, and most of them have done very well considering their value for money. Now, the company is back with a few new sports headphones — like the JBL Endurance Sprint headphones. But can the JBL Endurance Sprint headphones live up to the JBL name and offer great value for money? We put the headphones to the test to find out. The JBL Endurance Sport headphones are built for sports, and it shows in their design. The headphones come in a range of different colors, including black, blue, green, red, and light blue. We’re reviewing the green model, and they look good. They’re really black with green accents — which we quite like. The headphones are a little big, but considering their around-ear design they shouldn’t be too unwieldy. They feature a JBL logo on each side, and a thin cable that wraps around your head during use. On the right earbud, there’s a MicroUSB port for charging — but the unit also serves as a touch-sensitive surface for controlling the headphones. Tap the unit to play/pause, or use multiple taps for fast-forward and rewind. You can also swipe for volume controls, and holding your finger on the touch pad turns the headphones on and off. Because the JBL Endurance Sprint headphones are sports-focused, it’s important they can handle sweat, and thankfully they can do so pretty well. The headphones feature IPX7 water resistance, so while you don’t want to take them swimming, if you sweat a lot or get caught in the rain, they should be just fine. In the box, you’ll get a few accessories — though there are a few others we would have liked to see. The headphones come with a MicroUSB charging cable and a total of three pairs of ear tips, but a carry case would have been a nice inclusion too. Still, despite the lack of a case, we like the overall design of the headphones. The headphones may be built for sport, and we found that they were good at staying in our ears, even during relatively high amounts of movement. That’s good news for those wanting to buy these headphones for sports use. When it comes to how comfortable the headphones were, we found that despite their large size it was pretty easy to get used to them and how they feel. At first, it felt like they were a little too big — but again, after experimenting with the ear tips and finding the right size for your use, you should get used to them pretty easily. When it comes to sports headphones, sound and comfort are perhaps of equal footing when it comes to importance — and we’ve already established that the JBL Endurance Sprint headphones are relatively comfortable. So how do they sound? Well, they sound pretty good too. The bass is a little more laid back than some other sports headphones out there, but that’s not to say that it sounds bad — in fact, we quite liked it. While mega bass fans will want to keep looking, there’s enough bass in there for most looking for something to motivate them during their workouts. The mid range is pretty well tuned, but it’s certainly tuned. In other words, if total accuracy is what you’re looking for, these probably aren’t the best choice for you. Still, the low mids are relatively warm, while the high mids seem to have gotten a very slight cut, which some might like. The high end is present and sibilant, and while it’s perhaps not as detailed and clear as some other headphones out there, there’s still plenty of it to go around, which isn’t always the case on headphones in this price range. The JBL Endurance Sprint headphones are wireless, and as such, you’ll want to consider both their connectivity and battery life when you’re buying these headphones. 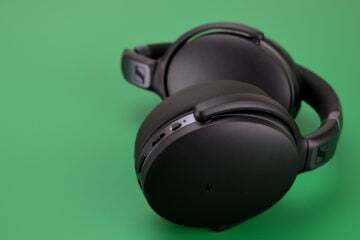 When it comes to connectivity, the headphones connect through Bluetooth, and as such you’ll get a connection range of 10 meters, or around 33 feet. We found that they generally connected well without too many bumps or skips except at unreasonable distances or through a lot of obstacles. The battery life of the headphones comes in at 8 hours, which is fine, but not spectacular. Of course, they do have some pretty serious competition, even at the $50 price range. For example, you could save a bit of cash and go for the Creative Outlier One headphones, which we really liked. Or, you could spend a little more and go for JBL’s own Reflect Mini headphones, which we also liked. Still, for $50, these are a great buy — and because of that, we’ve awarded them the Headphone Review Bronze Medal.